These are all other ways of describing what we at Climate Interactive call multisolving. With the same dollar, you can tackle multiple problems facing your community, while also protecting future generations. Read on for a sampling of resources to help you make multisolving happen in your world. Enjoy them and sign up here to make sure you stay current as we add new tools, resources, and inspiring stories of multisolving. Building bike routes in Germany reduces carbon emissions from driving while making travel more safe and affordable, and improving people’s health. Composting programs reduce methane emissions and fuel use while enriching the soil and lowering water usage in lawns and gardens. Forest preservation groups in Kenya save trees from illegal logging while providing jobs for marginalized youth. Ten Strategies for Capturing Multiple Benefits in Climate Action Plans – Advice for cities, states, and businesses to ensure co-benefits come with climate change mitigation. 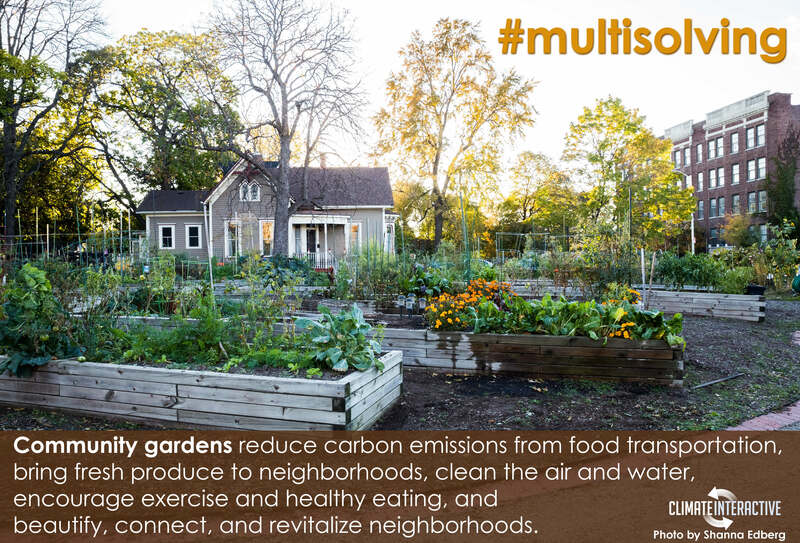 Multisolving Policies – Collection of policy elements that help ensure climate and energy policy also delivers co-benefits in health, equity, and well-being. FLOWER – A visual tool to explore the mix of benefits that your policy provides and whether it addresses social justice and equity, ideal for working with groups. Join the community of multisolvers on Twitter using #multisolving. Listen and share our latest webinar on Exploring Climate Solutions: Multisolving by Elizabeth Sawin and hosted by the Connecticut Governor’s Council on Climate Change (download pdf of webinar slides). Post and share the image above with your social network.